Those of you who know me, realize I carry a library in my pocket/purse. 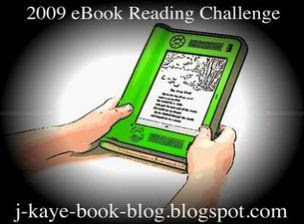 So when I saw that someone had a challenge on their blog for ebooks I knew I had to add it to my list. Guidelines are on the blog but basically, I need to read 10 eBooks this year. Yep, year. I'm currently reading on an iPod Touch or Mac and while the Touch isn't the same as my old Palm, I like it a whole lot better then the Kindle. I did purchase a Kindle. Used it for a couple of weeks. I liked the feel, the selection, the fonts/sizes, the screen look, the extra memory card slot. However, every time the page turned (too slowly!) the whole thing would black out before the next page showed up. It was giving me a headache so I returned it. They fix that and I'll consider it again. The links to post your reviews are up in the right sidebar at J. Kaye’s Book Blog. Wow...bad news about the Kindle. I got the sony e-reader, the old one. It's slow, but doesn't black out. Now that I have the rhythm down, I hit the button right before the last sentence. What kind of Palm were you using before?